Welcome to Freddie’s Dog Portrait in Oils on canvas. Our clients, her win the UK, wanted to have an oil painting at 14 x 11 inches. Vanessa and her family emailed two photos for Nicholas to use, one for the pose and another for colouring. The photo of Freddie was an outdoor photo with a green background. Consequently, a muted green colour works superbly in the painting. Vanessa and her husband emailed us when they received the portrait and you can read a testimonial below. 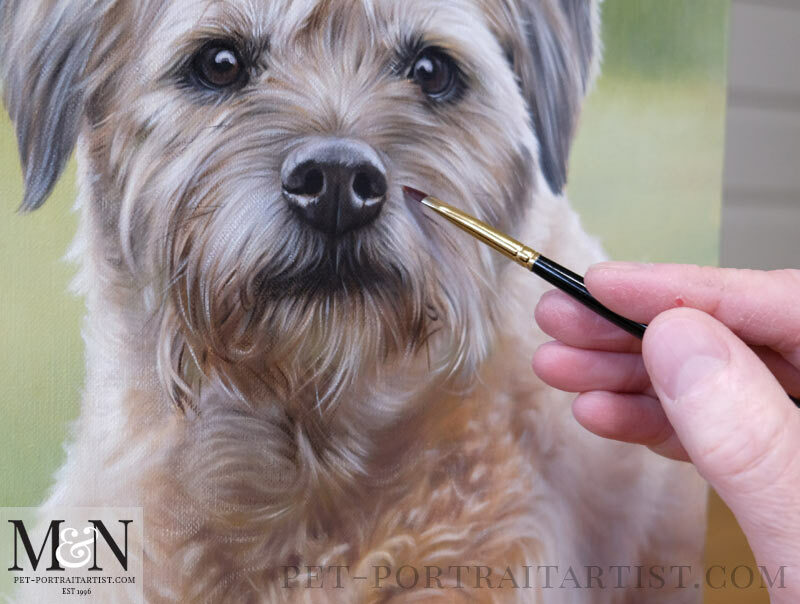 You can also see the portrait in full on our dog portraits page on our website. Just to say we received Freddie’s portrait and we couldn’t be more pleased with it. 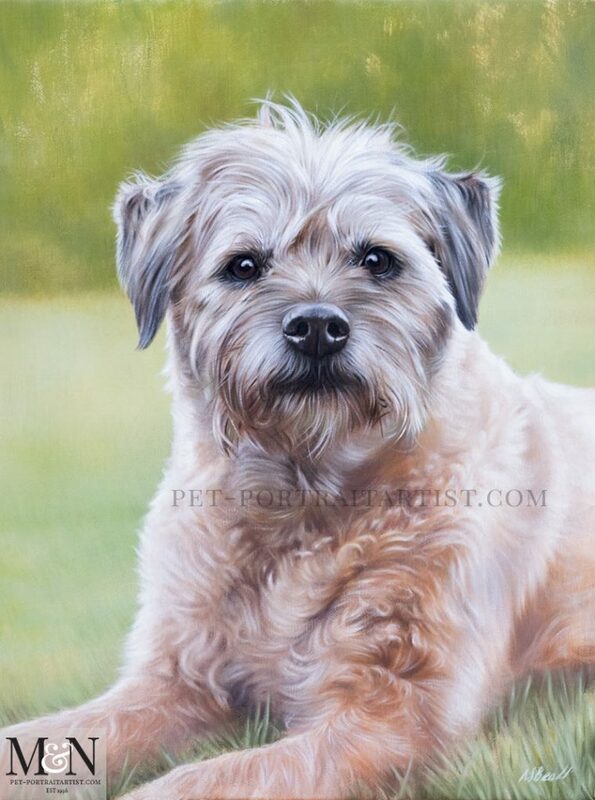 You have absolutely captured our gorgeous and very loved little doggy. Nicholas you have an amazing talent – and we will treasure the painting forever. I took a few photos of Freddie’s painting with Nicholas’ hand so our viewers can get a sense of scale. The 14 x 11 inches canvas was a good size for Freddie’s breed. Nicholas thoroughly enjoys creating head and shoulder portraits where the dog goes off of the side of the canvas. Also Nicholas is extremely good at painting grass around a dogs paws and legs. You can see this in Freddie’s painting. Similarly he uses very natural tones and colours for the grass which is very important. You don’t want to have bright colours around the dog to pull the focus away. Overall the painting of Freddie has a perfectly balanced tonal range. A photo of the oil portrait up close. 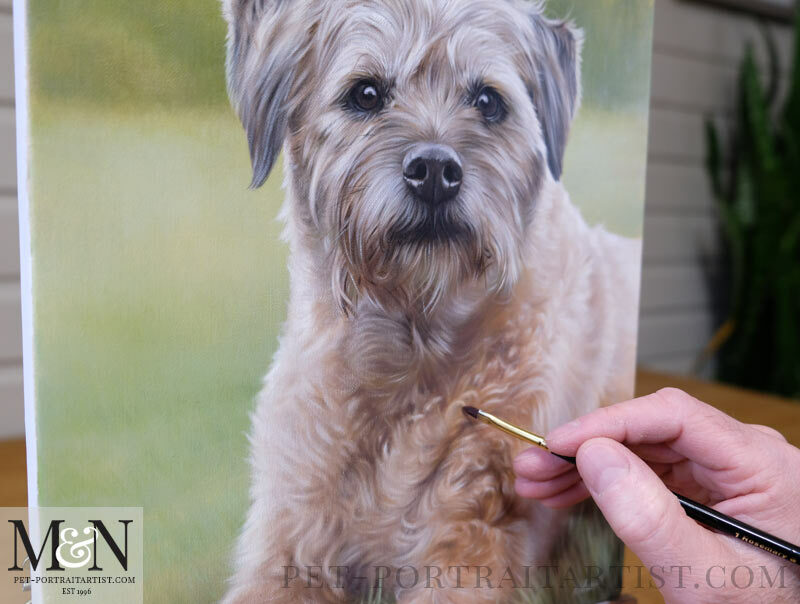 If you would also like an oil painting of your dog similar to Freddie, why not drop us a line. You can email photos to us at any time, send as many as you would like at their largest size. In addition, if you need guidance in taking photos we have a brand new photography tips page to guide you .. Taking Photos for A Portrait.